Today kicks off Christmas week on the blog! I'll be sharing something every day this week starting with today's announcement + two other posts this afternoon! I've put together a DIY Mystery Supply Challenge! 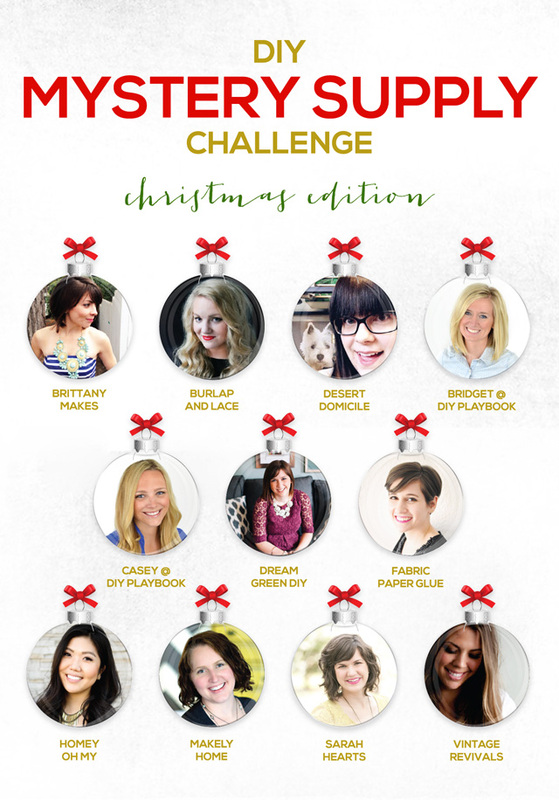 I asked the other amazing bloggers shown above to participate in it with me and to my surprise, they all said yes! What's the mystery supply challenge? Ideally I'd like this to be an ongoing, seasonal challenge featuring different bloggers or recurring ones if they're still on board. For the Christmas edition, we're making ornaments! Like the chefs on Chopped, we're also able to access our own version of a pantry/fridge AKA our craft stash, garage, etc. How FUN!! I can hardly wait to what come out of the "pantry"!! Sounds so fun!! Can't wait to see everyone ornaments! Great idea Caitlin! This sounds so cool! It's going to be super rad!